Yangon (Agenzia Fides) - "Myanmar is going through one of the most harrowing moments of its history. The people of Burma are deeply saddened. Myanmar needs the attention of the world in order to strengthen its fragile path of democracy": says Cardinal Charles Maung Bo, Archbishop of Yangon in an urgent appeal sent to Agenzia Fides. The text cites the report published on February 3 by the UN High Commissioner for Human Rights, calling it "deeply disturbing". The United Nations reports brutality and other serious violations of human rights by the Burmese security forces in Rakhine state, recounting acts of "barbarism and inhumanity hard to read and hard to believe", says the Cardinal. It is "a wake-up call for all of us", he adds. 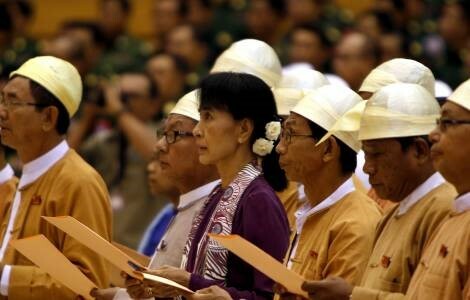 "Over the past five years, Myanmar has experienced many positive changes and has become a more open country. It is a dawn of hope", reads the text, pointing out changes in the economy, in the media, in society, in democratic mechanisms. Cardinal Bo noted: "We pray earnestly that this does not become a false dawn. Hate traders are in full swing. Hatred towards people of different ethnicity and religion has intensified and reached an alarming level. What happened in Rakhine state must be stopped once and for all". A cause for concern is the situation in the northern states of Kachin and Shan, in particular after the arrest of two Christian pastors of ethnic Kachin, Nawng Latt and Gam Seng. "I pray so that justice is done and for their release. I also pray for the thousands of displaced people caused by the recent military action in northern Myanmar", writes the Archbishop of Yangon, asking the government to "end the military offensive against civilians in Rakhine state and in the states of Kachin and Shan". "Peace is possible only with justice", he says. The appeal also mentions the recent murder of Muslim lawyer U Ko Ni, calling it "another step backwards for Myanmar and a major blow to the hopes for democracy and peace in our country" and asks the government to "allow free access to humanitarian agencies, the media and human rights observers in Rakhine, Kachin and Shan states". The Cardinal hopes that the Burmese executive "operates alongside the international community to investigate crimes reported by the United Nations" and "calls on the international community to be vigilant" and to "support the current Burmese democratic government".